You know what is incredibly satisfying in the midst of dealing with a messy house due to a water leak needing repair? 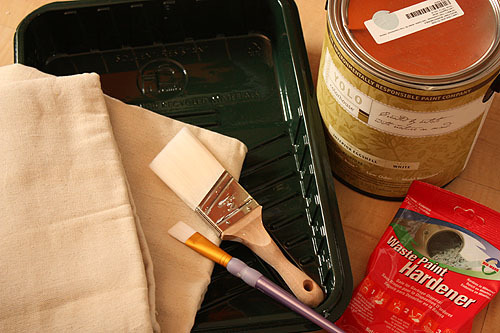 Redoing a room that is completely under your own control. We recently finished getting our bedroom in order (it took us, um, a long time). And know what? I think I finally understand what people mean when they refer to a room as a sanctuary. I keep wandering into the bedroom to take one last peek. Yay for new and more organized things. While the room might be my sanctuary now it’s a very small sanctuary. The room barely fits our king sized bed (which I refuse to give up, don’t even suggest it) and because the window faces a neighbor’s house which sits higher on the hill above us it can also feel very dark even when the sun is shining brightly. And before you say it let me say it, I know we need art above the bed. But we are struggling to find something big that we like and that won’t potentially fall on our heads. Did you know we have earthquakes here? We have earthquakes here. I’m afraid of earthquakes. Or, rather, big heavy things falling on my head while I’m sleeping because of earthquakes. Because the room is so small I thought it was very important to avoid filling the room with unnatural materials whenever possible to keep the air quality in the space as good as I could. When we moved into our house we painted all the walls and ceilings with zero-VOC paint. We we decided our all white walls were good for keeping the room bright, but we really needed some color to make the room seem more intentional? Grown up? Yolo Colorhouse to the rescue. They make great colors. Know what I’m not so good at? Making decisions. Going through the colors of Yolo Colorhouse paint options was so much fun I kept hanging more and more swatches on the wall, as you can see above. Scott and I went back and forth on what color to paint the wall. I originally wanted something dark and dramatic but he pointed out that the winters here are so dark that a dark wall might appear darker than I intended. Then we thought maybe a bright blue? But we just aren’t blue people. We wove our way through yellows, back to red for a moment, then Scott suggested we go with a gray that we could easily accent with different colors as we wished. Good thinking, sir. The paint is a cool gray and it looks richer than you might think of when you envision “gray”. We used Water .03 which is actually a blue but in our room it appears gray. I was so glad to get a few of Yolo’s painted posters that we hung on the wall, it showed us exactly how the paint color was going to act under the different light conditions throughout the day. We tried to be conscious of the environment when we were painting. We bravely decided to skip the plastic tarp and use a canvas one instead, though we did put down a layer of cardboard underneath and used another bit of cardboard to hold the can of paint because, well, I’m clumsy. We gathered rollers from previous paint jobs, my favorite short handled edging brush and a smaller craft paint brush that I use to neaten up my atrociously crooked edges. We managed not to spill anything! We also used a paint roller tray made from recycled plastic and bought some waste paint hardener. Waist paint hardener is like magic, it soaks up your leftover paint making it into solid so when you dispose of it it won’t leak. Just a note, Yolo paint is available at some Lowe’s stores. They offer all the colors that Yolo makes, we bought ours at the Renton store here in the Seattle area. 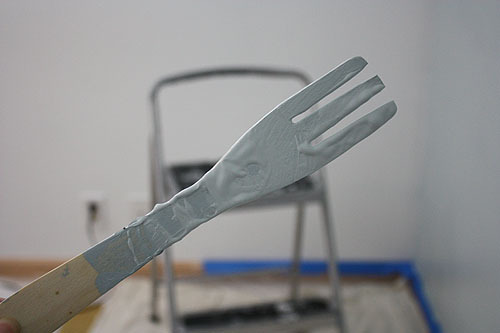 When we were ready to open the can of paint we found we didn’t have a stir stick, so we ended up using this old wooden fork we had in the kitchen. I was all ready to buy the lowest profile bed frame I could find and DIY a headboard and some floating bedside tables in the little space that remained on either side of the bed. We have about 16 inches on either side of the bed and even the bedside tables I could find that are meant for tiny spaces were about 20 inches wide. Even if we could have found one I felt like it would have taken up a bit more visual space than I wanted to give up. That and I’m awfully clumsy so avoiding having yet one more thing I could stub my toe on made sense. I had plans for installing picture ledges on either side of the bed that would be just enough to hold a glass of water, a book and an iPhone and charger. I was pretty excited about it. But then we found a bed frame that has a built in shelf behind the headboard. Problem solved! Additionally it sits fairly low to the ground meaning that the room doesn’t feel filled with a tall bed. 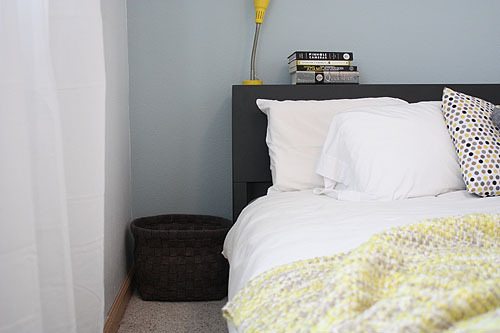 I put these soft woven felt baskets next to the bed to hold extra pillows and iPhone cords. I cannot stub my toe on these no matter how hard I try. It’s basket love. We have this Muppet-like shag rug at the foot of the bed. It makes my toes warm in the morning as well as reminding me to take my shoes off before I enter the room (a bad habit of mine). I find wool itchy (sad!) so I was happy to find this one made of cotton jersey strips. I’m honestly surprised at how well the rug seems to anchor the room and make it seem more welcoming. I see many more area rugs in my future. To make this yellow and gray pillow that is out of focus in the photo above (sorry, apparently I didn’t take a better shot) I used silhouettes of our profiles cut out of wool felt. I was hoping it would look like that faces/vase optical illusion but instead it looks like we are about to kiss. This wasn’t my intention but I think it’s sort of cute. The room is too small to hold a dresser with a top so I had to find some way to store my jewelry where it was organized and I could find it. I used these large cork tiles and t-pins from an office supply store to separate and hold everything. If I get more I can simply add some pins. It’s great to be able to grab a pair of earrings and not have to spent a few moments untangling them. It’s also great to have a spot where I can put my wedding ring and do a quick check to make sure it’s there. Did I mention I lose things easily? I lose things easily. What else? 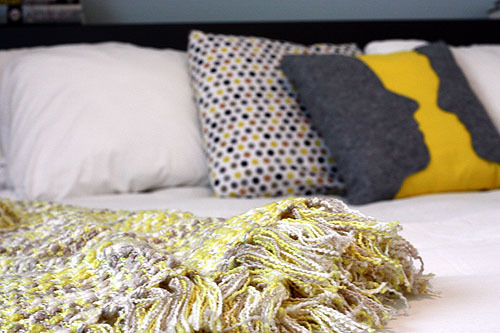 We have simple white cotton bedding and curtains to keep the space bright and calm and easy to accessorize should I find myself getting tired of yellow. We added a larger mirror and it makes a huge difference when I’m heading out and need to get a glance at my outfit. I’ve noticed that the sound in the room is softer, I think with the addition of longer curtains, a very dense rug and maybe even the yarn around the lamp sound is deadened a bit. It makes for a very “ahh” sort of feeling when you enter the room. And last, the overhead light. 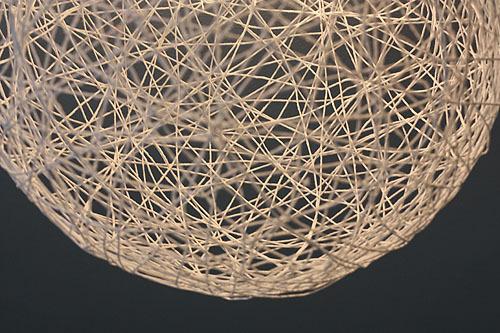 I really want one of those Random string lamps but cannot afford one. I’ve seen them DIYed and figured this was the perfect time to try it out. And let’s just say I learned some lessons in the course of not getting this one right at all. It mostly fell apart when I deflated the small yoga ball I used as a form, there wasn’t nearly as much yarn in the skein I bought as I thought there would be, and I think my idea of setting it over a light fixture that is set in the ceiling is entirely the wrong way to go. You can’t tell from the photos but this ball is seriously lopsided. But, I did learn that as long as the light fixture is airy like this it doesn’t crowd the room as much as I’d feared, and it softens the room a bit, distracting you from the boxy shape that it is. You will be hearing more about the string light fixture, at least once I have conquered it. 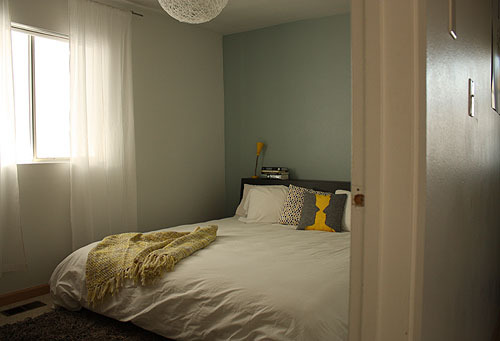 Huge thanks to Yolo Colorhouse for helping to transform my bedroom! 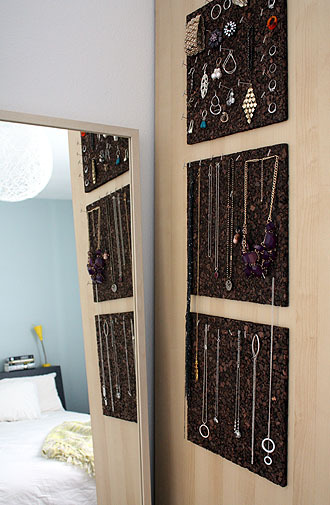 I especially like the jewelry storage; but how did you get the cork on the wall? Why not have a go at making your own wall art with some simple paint techniques? Or a soft, textile-based wall hanging that won’t hurt if it lands on top of you during an earthquake. Who says pretty rugs have to be confined to the floor? Megan, did you forget about the Rasterbator for your bedroom art? Or other poster/art software? I *love* that jersey strip rug, it looks so comfy. Do your toes ever catch in the loops? I wonder if it might be DIY-able. If you ever have a few moments to tell us more about how it seems to be made (how are the jersey strips secured, how long they are, etc.) I’d be very grateful. Thank you! Megan, talk to a frame shop about security installation. I do this for all of the artwork installed in public spaces. There is a locking t-bolt mechanism that secures the artwork to the wall (plus hanging on two d-rings vs wire). In most cases used to deter theft, but in your case to deter shakes. You are no longer relying on wire and a nail. I look forward to seeing the artwork that the space is begging for. Have you thought about a textile piece? Yay for you!! Such a lovely room, I really like the gray. You’re not the only one who takes a long time to get stuff in order, my bedroom STILL has college-era furniture. What about one of those string murals for over the bed? The cork board with t-pins is GENIUS! I’ve been hoarding away about 500 ideas for how to organize my jewelry and not only is your simple, easy and cheap(!) but it also looks really nice! I am totally doing it this weekend! We even have a dollar store up here that you can get a 12″ cork board for $1. Total score. +1 to what clotilde said, though I’d also like to just know where you got your rug from–looks really comfortable! And the space above the bed seems perfect for an awesome wall decal of some kind. Oh my God. I love it! You made the light fixture? And the cool pillow? The jewelry board is fantastic and I love the shag rug too. Gorgeous. You super rule, Megan. Looks great! I, too, am intrigued by the rug. And I love the gray with pops of yellow. I solved the problem of “art” above my king sized bed by framing a 19″x42″ USGS map of a very memorable hike we did together. (I have photos from the hike on an adjacent wall.) The frame is big, but I had plexi put in instead of glass and it’s hung on two picture hangers and reinforced with lots of the 3M velcro poster hangers. Would you mind sharing where you found your new bed? My husband has been bugging me forever to get something with some built-in space for books and that looks perfect! I store my jewelry the same way! Have since I was a teen. Nothing works better! What a beautiful room! 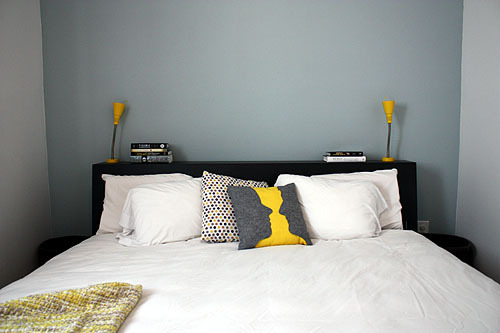 I love love the wall color behind the bed – the perfect mix of blue and gray. My cats would LOVE those soft bedside baskets…. Put a decorative rug over the bed. I had a picture hanging over my bed until last year when a minor earthquake dislodged it. But then I remembered that I have a Native American rug that I love but don’t have a place for. It’s now going over the bed. I am totally in love with that silhouette pillow idea. Genius! Several people have already suggested what I was going to for some art above the bed (textiles), but I was thinking of a small quilt or pieced wall hanging. 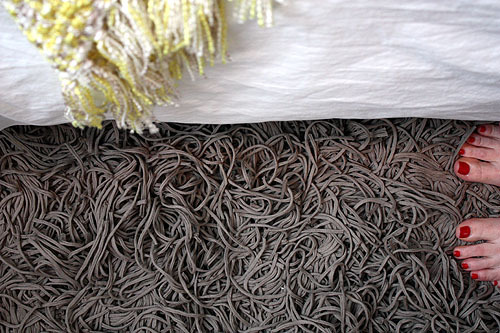 Am I the only one that thinks the rug looks like worms? The room looks great – I love the carpet, too. 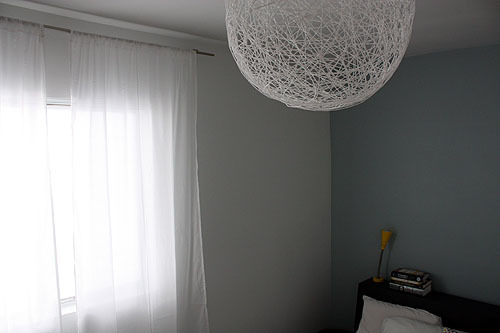 especially b/c it sort of looks like the texture matches the string fixture. omg. your post could not be more timely. 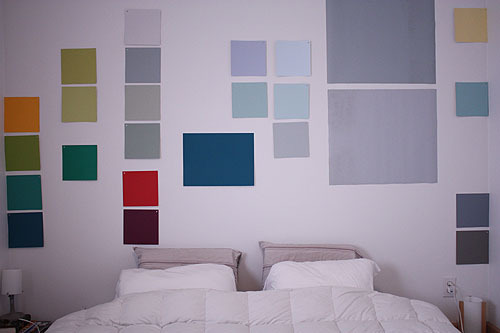 Fiance and I have been trying to decide what to do about our bedroom and last week hung paint swatches. He is all about darkish gray and I like bright blue. Cut to me locking myself into the bathroom crying “how can we be planning a life together when you like gray paint?” There may also have been PMS involved. Anyhow, I love this color and I think it could be a win win. Also nice to see how it looks in a teeny room as we also have one of those. Thank you! Answers! Sorry, I slept in. #1 Erin – The cork tiles came with adhesive pads to hang them. They are mounted on Ikea clothing storage we already had so I’m not worried about it ruining the side of the furniture. #2 Sally – We are thinking of that. For some reason I’m having trouble thinking up what I want to see every day that I can do myself. #3 Emily – Nope, didn’t forget. But we’ve got a Rasterbator image hanging above our stairs in the living/dining area. I think another one might be overkill. Still keeping it in mind, though, thank you! 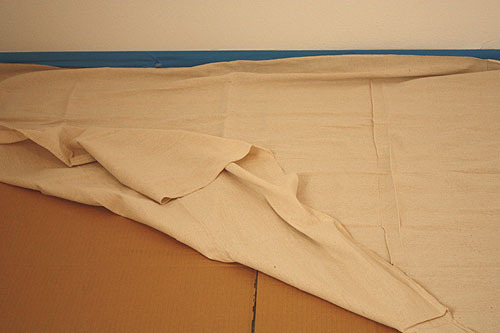 #4 Clotilde – I’ve put up a few detailed photos about how the rug is constructed. It’s definitely DIY-able, though time consuming! Christy – Thank you, I didn’t know that this was an option. Though, duh, I’m not the only person who might be worried about it. We have thought about fabric options but didn’t yet come across something that we like. #6 Erica – A string mural! I hadn’t thought of it and it might be perfect! That wall has a number of flaws already so a few dozen pin holes wouldn’t be too bad. For everybody else I think Erica is referring to is like the one you can see here at Wise Craft. #7 Krista – I was surprised at how much I like being able to see everything all displayed for me. It’s super easy to slip earrings on when I’m headed out the door. #8 KWu – Sadly we have some massive orange peel walls so the wall decals won’t stick as well as they could. I’m loathe to order a $100+ decal only to have it peel off slowly. #9 Melanie – Aw, thanks. #10 Rebecca – How sweet! And plexi sounds good, especially if the frame is secured (which I just found out is possible!). #11 Amanda – It’s from CB2, the Alpine Bed. I’ll email you some longer good/bad details for it. #12 Bee – Yay! Smart girl. #15 Amy – Good idea, I’ll keep an eye out. #17 Meg – Nope, I think it looks like worms too! But only up close. IRL it’s far more Muppet than worm, promise. Our room is a lovely light grey (we used Sherwin Williams paints, no VOC) with a sage green trim. If we got our act together about the rest of the room, then it would be a sanctuary. Right now it is just a place to shut our eyes when it is night out. Because a few people have asked, here are a few details about the rug shown above. I’ve put them over at Flickr starting here. It’s definitely DIY-able but I wonder if the cost of jersey to cover as large an area as the rug I need (4′ x 6′) would be equal to the price of the rug itself. As you can see the construction is fairly uncomplicated so if you have time on your hands it wouldn’t be difficult to make. I always think of earthquakes when I see Ikea catalog small room layouts. Something heavy is always over the head of the bed. Ack! I was going to suggest a stencil of some sort to emphasis the ‘statement’ wall nature of the grey wall. Of course there are oodles of great suggestions here. For another idea for wall decoration without worrying about earthquakes. My in-laws screwed some carpet tack strips to their wall (http://www.halexcorp.com/carpet_tack_strip.shtml) and then put some felt on the back of some fabric wall hangings. Now they just stick it up on the tack strip. Easy to readjust or move around. Also, you can pull down the fabric stuff easily and toss it in the dryer to get rid of dust. You can easily hang a quilt that way, it supports quite a bit of weight. I’ve been following your blog for a while now, but this is my first comment – ooh! exciting! How about some faux bark cloth for over the bed? You could do a wall decal above the bed. Great visual interest and no threat of harm during an earthquake. Anotheryarn – I do have a stencil book around here somewhere. My fear is that I would get tired of it (I’m fickle, what can I say) and then I’d have to re-paint instead of just removing it. Cybele – What a good idea! Jenny – perhaps! If I could find a pattern large enough. Or mabye that Marimekko birch trunk fabric? Oh I have been suffering the fate of a king size bed meets “small” circa 1900’s bedroom and this post instantly made me feel better about the lack of space and how we’ve tried to make it look big anyway. Thank you! Love the paint colour choice. And the DIY light fixture. Can’t wait for that post. I love it! It looks airy and cozy at the same time! OMG! I just found a similar headboard for my bedroom makeover, too! And I’ve painted mine black, as well. They’re the best, aren’t they? So handy! Awesome! So light, airy, and pretty! And I totally think your pillow is awesome and looks like one of those vase/face pictures. In fact, at first glance, I saw the vase, and not the faces. 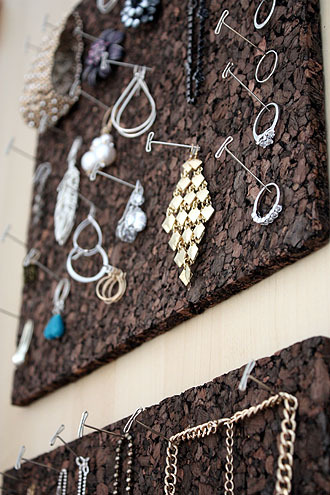 yeah I really like the cork square idea for jewelry storage. Things vanish in the dark depth of my jewelry box all the time, this is perfect to accommodate all of the different shapes and sizes! I don’t know, I think you did achieve the optical illusion thing with the pillow — I didn’t see the silhouettes until you pointed them out! Your room looks gorgeous! I don’t know if someone already said this, but you could find a pattern or drawing that you like, transfer it onto the wall with a projector and then paint it. Can’t wait to hear more about the string light fixture, I bought all the ingredients for a similar project and they’re sitting here staring at me. It is absolutely beautiful and so serene! We have the same color in our small bedroom with a white bed and I love it. I have enjoyed watching the color change in the different seasons. If there is a print you like, just have it applied to foamboard. I don’t have earthquake worries, just am completely incompetent at hanging anything. I have a 20×30 hanging over my head right now that I attached to the wall using a couple of leftover 3m strips from one of their hook packages (pretty sure you can buy just the sticky things now). Looks great and is way way WAY cheaper than adding a frame/matt to the cost (& I’m guessing that earthquake/theft-proof setup adds even more $s) – if one of your own images, so cheap you can replace w/ no regrets if you get bored of image. If it is your image – get printer to adhere it, that way if there is an oops, they just re-print. If buying from photographer, ask if they can offer option. Shipping cost goes up, but worth no headache. I’ve also seen (guess not here) the suggestion of taking some sort of fancy tape to tape plexi to a matted print so that the tape looks frame like. I don’t have that kind of even edges skill & prefer clean look of the foamboard mounting, but if you feel need for protection between print & air, that could be option (you would need a matt board as prints should never be smack against glass or plexi). Thanks for a great post…. I also love my King size bed… been looking for a new one and it needs to be low to the ground…. would you mind sharing the manufacture of yours please? I LOVE the look of it. I love the colours you’ve used, it looks great and so relaxing. Emie – It’s the Alpine bed from CB2, I’ll be email you with some good and not so good points about it which are too long to put here. Thanks again everybody for the great tips and the compliments, I really appreciate it! What about adding another mirror over the bed instead of art? No time now to read all comments; sorry if this duplicates. But that would add more light. Or try a strip of rectangular mirror with a row of art pieces above it? Can’t wait to see your next step. Warmest aloha. Is this the rug you were tweeting about a couple of weekends back? Would love to know where you found it (Maybe I missed that above?) Can you CC me on the pro/con of the bed e-mail? My BF has been searching for a new one and this seems like a contender but I would love to know your thoughts. Brianne – This is the rug I was tweeting about, I was thinking flotaki but I think this one will be far easier to clean and I still get the cushy/fuzzy feeling. Deets on the bed are being emailed now. Oh were can I find the rug on line? I want one under my desk. I love the way your room turned out! I also had a lot of trouble finding a bedside table to go with our low profile bed (a different CB2 one) and tight space. We ended up getting the round Componibili storage units in a nice bright red for a pop of color. They’re only 12 inches in diameter and 16 inches tall. It’s perfect for a small lamp, a book, and my alarm clock. Catherine – Nice! I looked at those but I also really wanted to find a way to store the extra pillows off the floor and the Componibili wouldn’t fit that. But they are so cute. Brianne and Patr – The rug is from Crate&Barrel, it’s the Remy rug in Shale (which is a bit warmer tone than would be ideal for me, but I’m in love with it so it’s not going back). When I first saw the photo of the yolo paint chips on the wall, I thought that it *was* the art. If you arranged those chips in a more interesting pattern and closer together, they’d make a cool piece of art for over your bed. Steph – I did really like having the colors up on the walls :) But, those are part of a Yolo sampler set. I don’t want to separate them from the stack (they are the complete line) and they all have a hole punched in the corner so they can be bound together on a ring making them look less than tidy on the wall. ha! I recognize the fork you stirred the paint with. It’s from a cheapy 3 piece set of ikea kitchen utensils. I had the same from the first time I set up an apartment and also eventually used them to stir paint. Our room is the same size, but not nearly as pretty! Gorgeous! Gorgeous room! I would love to hear your pros/cons on CB2’s Alpine bed, as it looks like it would be perfect for our small-ish master bedroom, too. Thanks! Can’t you make art out of the big color swatches? Or a modern quilt for art?. Quilts don’t hurt you when they fall on your head. I love the pillow, but I didn’t even see the faces at first so I think you succeeded in your original plan! I like the grey and yellow… very on-trend! Also i LOVE the rug!!! I seems messy and chic at the same time. Nice job! i love gray and yellow together.. great job! and i too have been trying to figure out a good way to replicate that random light!!! To me look like those paint samples could be easily transform in some art… just cover the holes with a dot of paper in contrasting color and secure to the wall like a giant puzzle. you can shift it every time you get tire of it. I´m a plastic artist from argentina, and i like to re use every kind of material that gets in my hands in my work!!! Madi – I have but our wall has an orange peel texture which means that at worst the decals won’t stick and at best they would look very messy and bumpy. Not ideal! hi, i think this is my first time posting here (i’m usually an inspiration lurker, sorry to admit! ), but just had to share an idea for above the bed art. my husband recently had a favorite photo he took in the forest printed via spoonflower.com onto plain cotton fabric, then tightly wrapped it around some acoustic foam (he has a music studio). you could easily do this with any standard foam though, and if it fell on you, it would only hurt as much as a pillow fight (probably less).